This cute scarecrow is one of my favorites. I made this several years ago out of a paper towel cardboard tube, some felt and a mini straw hat. It’s a fun fall craft for kids and is easy to make. No patterns needed! I used hot glue, however you could easily use instant grab glue or just wait a little longer and use white craft glue. 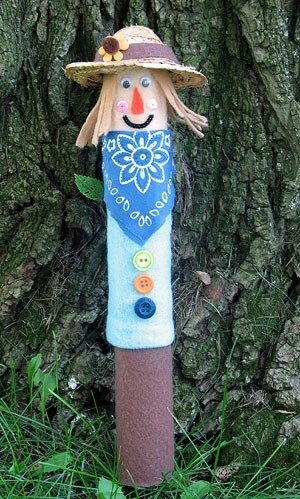 Looking for a fun scarecrow craft for the kids? Try this paper bag scarecrow! How cute! What a fun project for the kids. how adorable!!!! I must make one of these too!!! Love this! It's perfect for my son's class to do at their fall party. such a cute Fall kids craft. 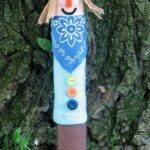 Cardboard tubes are always so readily available and I love making kids projects with them too! Awww…he is so CUTE!!! Thanks for joining us at Patches of Pink! Very cute idea. I have saved oddles of the tubes too as I have been making little snowman hats of the tubes. I was wondering how you made the snowmen hat as I am trying to come up with some for a project I’m doing. Thanks! Hi Liz. I’m not sure which hat you are referring to?